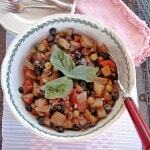 Mom’s caponata is one of the reasons I started this blog. It is one of those dishes I have loved for years but never attempted to make myself, because…Mom makes the caponata. 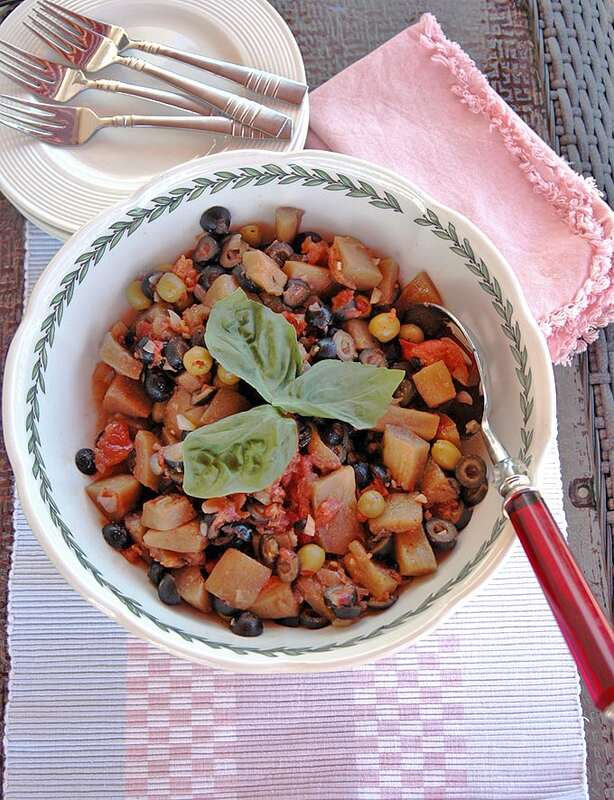 Best eaten cold or at room temperature the day after it’s assembled, caponata is a sweet-and-sour salad of cooked eggplant cubes, onions, crushed fresh tomatoes and garlic, tossed with black and green olives and some basil. It is stand-at-the-counter-and-eat-it-right-out-of-the-bowl delicious. My family is addicted to it and will graze on it all day long. But Mom is in her ’70s. I can’t imagine life without her. I also can’t imagine all of her food — and by extension, my Nonna’s food — disappearing from my life because I never bothered to ask how to make something and write it down. This blog enables me to pass along these treasures to my children, relatives and future generations of our family. The bonus is that anyone reading can get in on the goodness too. With that said, this Sicilian dish is not quick. It requires at least an hour of hands-on work, plus time to marinate overnight. It’s definitely a weekend thing, perhaps something to make Friday night to bring to a potluck on Saturday. It’s dairy-free, so it holds up well on a buffet table. It’s also gluten-free and vegan, which comes in handy. 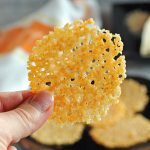 We like it as a side dish (or for lunch with a nice chunk of bread), but it can be an appetizer served on crostini as well. I need to talk about eggplants for a bit. Mom told me to peel, cube, and seed the eggplants before cooking them in olive oil. Next time, I will buy smaller eggplants, which supposedly are younger, less bitter and should have fewer seeds. I read that the heavier the eggplant, the more seeds it will contain. There is a myth about the existence of male and female eggplants, and conflicting reports about looking at the shape of the dimple on the bottom of the eggplant to identify which ones have more seeds. At any rate, it’s important to make sure the eggplants are glossy, feel firm and spring back if you press on them with your thumb. Don’t buy any bruised eggplants, and the top leaves should be green, not brown. I also learned it’s important to use the eggplants within two days of purchasing them. The good news about caponata is that this dish keeps well in the refrigerator for up to five days, if covered tightly. 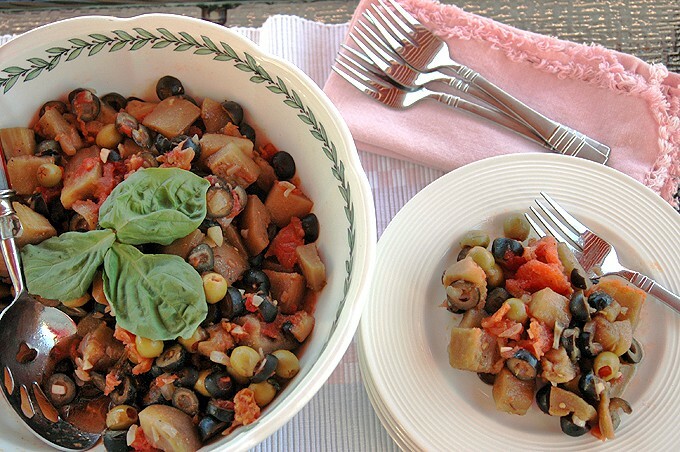 Around here, though, Mom’s caponata is always consumed long before the five-day mark. Use a peeler to remove the skin from the tomatoes. For each tomato, cut a circle around the core to remove it, then cut the tomato in half. Cut each half in half again. Squeeze the tomato quarters gently to loosen the seeds and scrape them out with a knife. Squeeze out the liquid from the tomato pieces and set them in a drainer. Pat them dry with a paper towel before adding to the caponata. Chop the onion and garlic. Heat oil in a large skillet on medium high. Add the onions and garlic to the pan and cook them until they are soft. While the onions and garlic are cooking, prepare the eggplant. Peel the skin. Cut each eggplant in half lengthwise, then in half again lengthwise. Slice the eggplant horizontally into cubes about 1.5 inches thick. Add the tomatoes and vinegar to the pan and stir briefly. Put the heat on medium and cook for 15 minutes uncovered, stirring periodically as needed to prevent sticking. 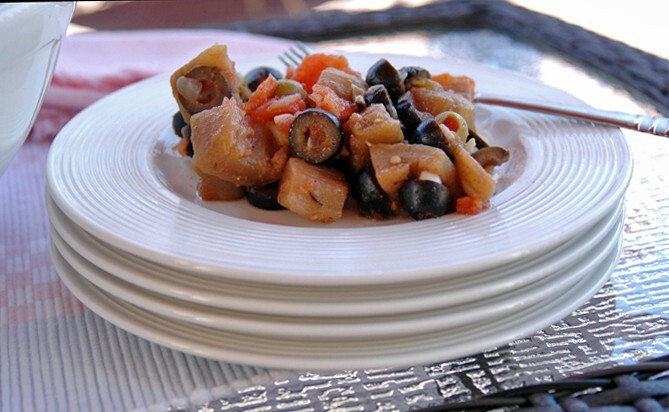 While the caponata is cooking, drain the olives and dry them on paper towels. When the caponata is finished cooking, remove the pan from the heat. Add the olives and sugar to the caponata. Stir to combine. 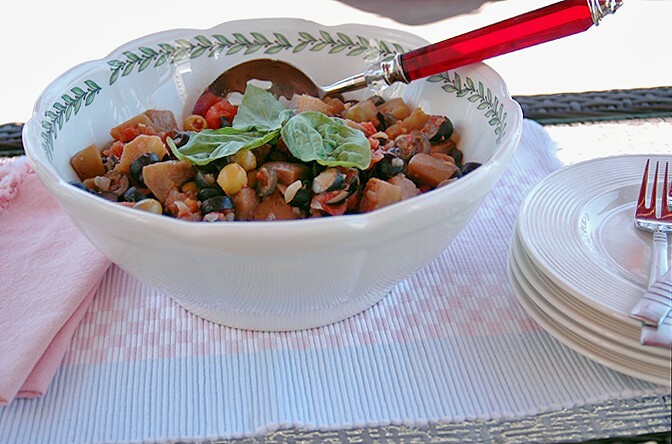 Place the caponata in a serving bowl, cover it and refrigerate it, ideally overnight. Before serving, stir the caponata and taste it to see if it needs more salt, pepper, vinegar or sugar. Be sure to try it with the olives, which will add a salty flavor. 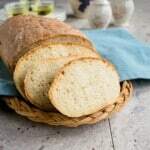 Serve cold or at room temperature as a side dish, as lunch with a chunk of Italian bread, or on crostini for an appetizer. My grandma was from Ventotene/Naples, she added capers and celery. 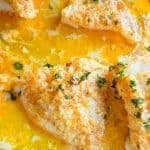 It you are right to write down and save these wonderful recipes. There were many dessert recipes’ I never wrote down. Little balls covered in honey then sprinkled with powered sugar, was one and another was a sweet bread like cake that looked like a mushroom my Grandma also made that we never wrote the recipe. Two generations are gone now so unless others from that region of Italy still make I will just have great memories! 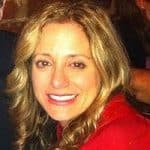 Hi Laura – I hope the recipes I’ve shared are helpful! Those little honey balls are called struffoli in Naples. 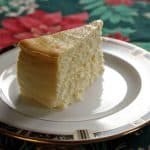 My mother-in-law makes them, but I don’t have the recipe on my blog. I just made this and it turned out kind of liquidy. Hoping that letting it sit overnight will absorb the liquid. Ana, do you think your tomatoes were overripe or maybe not drained well before you started? It’s important that the tomatoes and olives be drained well and blotted. In any case, let the caponata sit overnight so that it can marinate and take on the flavors. Then, in the morning, you can use a slotted spoon to transfer the caponata to a different bowl without the excess liquid. Then, taste the caponata to see if it needs any more olive oil or seasonings. I can’t wait to try this out!! Pinned! Tash, thanks so much. I hope you enjoy this!